I learned to cook from two women: my mother, and Julia Child. The latter was from a book, but nothing beat looking over my mother’s shoulder and pestering her with questions. This occurred shortly after I graduated from college, moved to Austin, and quickly realized that the only way I could afford decent food was to make it myself. It did not take many canned soup evenings to tenderize my brain into an eager state to learn. When we traveled down to Washington D.C. this past weekend, I had a chance to cook in my mother’s kitchen and tried to make the most of it as time permitted. The dinner was not complex, but the results were successful: this salad followed by a ramp and mushroom risotto (posting next). 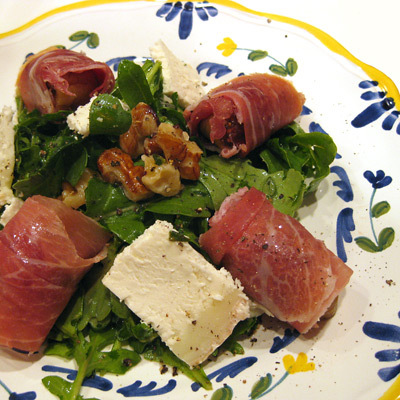 This post is about the salad: simmering dried turkish figs with thyme, wrapping them with prosciutto, and serving on a bed of arugula, walnuts and goat cheese with a lemon/olive oil dressing. At the bottom of the post, I’ve also included some photographs taken while walking around Georgetown.